Christmas Mix Gluten Free a ready to go 700g bag of soft party mix with a Christmas theme. These soft and tasty jubes are gluten free and the perfect party mix for your Christmas party. No need to worry if anyone has a gluten sensitivity with these lollies. 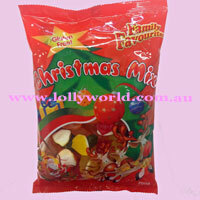 Christmas Mix Gluten Free a ready to go 700g bag of soft party mix with a Christmas theme. These soft and tasty jubes are gluten free and the perfect party mix for your Christmas party.